My mother is in Silver Creek. It's a beautiful place. I'm really impressed with their food service; it's really good food. The residents can walk in any time and order whatever they want. It's really nice and you don't have to follow a regimented timeframe. All the public areas are very nice and they have a lot of activities going on all the time. All assisted living places to me are expensive, but this to me is a more reasonable one. Definitely the best one we've looked at. The rooms are nice, and any time we want something done they have a really good maintenance team. The building maintenance supervisor is very easy to get in touch with, and he always does what he says he's going to do right away. We're staying in their most minimum room which is all you need. There's a bed, bookcase, an end table, couch, another end table, a TV area, and an area where she can sit and eat if she wants to bring her food up into her room. There's also a big bathroom, big closet, and sort of a kitchenette area. I think the administration staff has not really been too visible. It was bad that we moved in on a big, long holiday weekend. It hasn't been super positive there. I had to search them out. Things like paperwork that they were supposed to follow up with and get from the doctors, they never followed through with. So I actually went to the doctors' office today to get it, and they had two weeks to get it. My mom was having a mini-stroke and no one noticed. The nurse had never met her and she had been there for several days because it was the holiday and no one really paid any attention. I'm more impressed with their facilities more so than their administrative staff, but their working staff like the people who clean, the people at the front desk, abd their building maintenance, those people have been great. As far as the amount of assistance that you get, it's like my mom is in a nice apartment with nice food and activities, but that's it. The price is kind of steep for that. The building itself is beautiful. Silver Creek was really nice and very upscale, it's almost intimidating. They have a lot of activities, lots of residential input, and the meals are even prepared by a chef. They actually serve red meat which is a biggie because the other places don't do that at all. You walk in and it has a huge massive ceiling, it's very modern, and the cleanliness is phenomenal. Plus, the pricing is actually cheaper than the other places, go figure. It just feels a bit overwhelming because it's so big and you don't see residents in the halls so it's kind of hard to run into people and say hello. It's like you're on a cruise ship, when you want something to eat, you just call them and they bring it to your room. The best way to get to know a community is by scheduling a tour. See the facilities, meet the staff and residents, and get a feel first hand what it's like to live at Silver Creek Assisted Living. 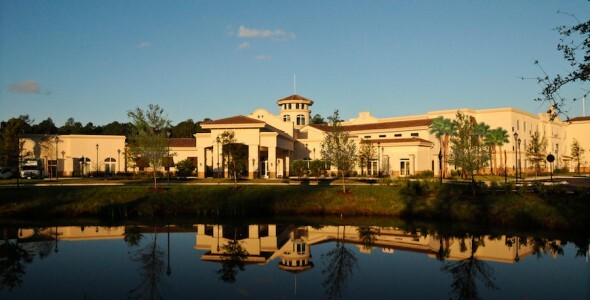 Opening in the summer of 2016, a premiere assisted living community located in St. Augustine Florida is Silver Creek with state of the art amenities and remarkable architecture surrounded by beautifully landscaped gardens. We are a close knit community that creates a warm and welcoming atmosphere. Silver Creek presents the future of retirement living, offering assisted living, memory support and respite care. Here you will find quality care in a safe, secure environment, with spacious and specially designed residences. At Silver Creek, we provide for continued independence and a sense of well-being through exceptional amenities, and customized care plans to meet evolving needs and preferences. You will fall in love with the grandiose manor style facility of Silver Creek. Surrounded by lush green trees and a great view of the lake in front with a bonus of clean fresh air. Residents wouldn’t be able to resist the beauty of our surrounding and would definitely encourages them to walk and exercise on our courtyards and garden. Our community offer spacious apartments with a variety of floor plans from studio apartments, one bedroom, two bedroom and companion suites that has access to the scenic view of the surrounding nature. All apartments are designed to provide comfort, safety and security to our residents. Our community aims to provide holistic wellness, happy and meaningful lifestyle to our residents. Our staff are competent and well experienced to ensure providing the best care services. They are available 24 hour a day and provides assistance in medication management, personal care and mobility. We are a pet friendly community because we know the importance of being with your beloved friends. We have parking available to residents and guest. Our care services are personalized to ensure that residents get the ample care they need because we believe that each patient has unique needs.